This book enables you to confidently choose the right path when up against the many choices of your life. 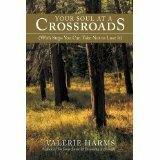 It provides exercises on relationships, work, and health that uncover the spiritual wisdom rooted in your soul. It offers both inspiration and memoir. See my blog on journal writing -- August 25. 2016 -- for fuller description. See a comprehensive review by James Strecker on my blog. When we feel in love with someone, we project missing aspects of our souls onto others. This book shows through personal example and psychological theory how love transforms us and leads to creative gifts, regardless of the outcome of the relationship. First published in 1992 by Shambhala, newly published in 1999 by Aslan.Travel & Leisure, November 2001. --"A refreshing antidote to the codependency literature. Harms tells not only how to disengage ourselves from others, but how to use our attractions to discover and develop our inner potential. A warm, empowering book." ~ Robert Johnson, author of He, She, and Inner Work. 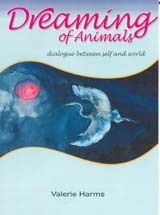 This book dives deeply into the lives of many animals, documents our relationship to them over time, and shows how to work with dreams and dialogues. A great emotion, transforming in effect, is released when we take the beauty and power of dream animals to heart. I am passionate about protecting all species of beings. --"a fine piece of work" ~ Jeremy Taylor, author of Dream Work, et al. Sections include ecology relating to our bodies, homes, communities, land and ocean, global politics. Because I knew Elvis personally and started his first fan club in Texas,this narrative biography shows more of what Elvis is really like than the typical documentary. This biography is far more than just a documentary. It covers Elvis’ early roots more deeply than any other book: his poor rural childhood, teenage insecurities in a big city high school and early successes in the South. Taking the reader behind-the-scenes of his short meteoric life span, it shows what Elvis’ personality was really like.Elvis came to mean so much to men and women alike. A rare book, uniquely printed, based on an intimate weekend conference with Anais at Wainwright House. Describes my involvement with these inspiring women. (Frances Steloff was the founder of the Gotham Book Mart in NYC). Real animals in real conflicts. Good for children under 10, published by Soundprints, 1989. Encourages readers to think about the problems they have that are similar to Beezus and Ramona's. 7-minute video shot at my home and at a workshop in NYC. Nicely done by Joanna Ashworth.